Rarely offered for sale Grevillea drummondii is a low growing species with a naturally dense habit. The short internode length leads to this bushy habit. 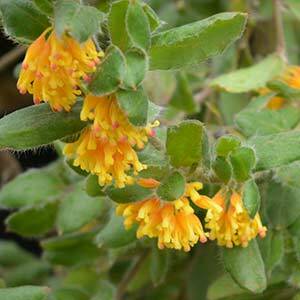 Attractive flowers in clusters are a yellow colour with hints of orange to red as the flowers mature. Found naturally in the south west of Western Australia from around Perth to the South. Mainly in coastal and nearby areas. This low growing species requires a well drained soil and is at home in sandy soils and rocky areas. On planting, the soil can be amended with a little well rotted compost. Young plants should be watered in well, with some additional water though the first summer. Once established, Grevillea drummondii is a very low care plant requiring little to no extra water. A little native plant fertiliser in spring will assist with growth. Although this species has a naturally bushy habit, a little tip pruning after flowering is recommended. The key to successfully growing this species is a very well drained soil. This is a low growing species, that can be used in the garden border. Foliage – Mid to deep green. Individual leaves are an elongated rounded shape to slightly elliptical. Flowers – Buttery yellow with touches or orange. Flowering period – Summer to Autumn. Frost tolerance – Light frosts only. Propagation is possible by cuttings or from seed.